Parents of Tarek Rahman, a joint convener of Bangladesh General Students’ Rights Protection Council, a platform leading the quota reform movement, remained missing since Saturday. 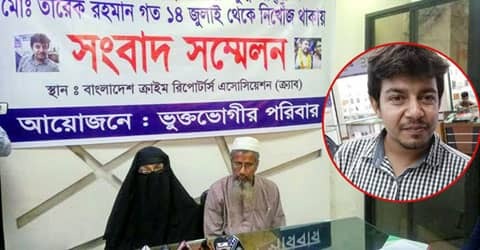 Addressing a press conference at Crimes Reporters’ Association of Bangladesh (Crab) auditorium in city’s Segun Bagicha on Sunday, Tarek’s father Abdul Latif and mother Shahana Begum demanded steps to trace their son. “Later, I went to Shahbagh Police Station to inform police when they said they will investigate the incident. I’ll lodge a general diary with the police station today,” said Tarek’s father. After completing his Honours and Master’s degrees from Cumilla University, Tarek got admitted to a job coaching center in Dhaka and involved in the ongoing quota reform movement, he said. Tarek was involved in the politics of Bangladesh Chhatra League (BCL) when he was a university student, he added. Yellow journalism in museum now!